Early modern mechanics was not only about building machines, but also about making men, It was an exercise of virtue that fostered a manly subject, known to contemporaries as the mechanicus. This study is a cultural history of that persona. Drawing on an eclectic range of sources from the pre-industrial Sweden of the eighteenth century, it examines how mechanical practitioners formed themselves in relation to a traditional and hierarchic state. 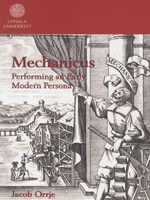 This book provides a series of case studies that shed new light on early modern mechanics. These explore how mechanical exercises were thought to turn boys into men, and how such exercises were perceived to form civil servants into an all-seeing community. They demonstrate further the staging of the absolute monarch through mechanical patronage, and how mechanical practitioners balanced on a razor's edge between vice and virtue during the radical political upheavals of early eighteenth-century Sweden.